Long time between summits HIHI! A public holiday provided the oppportunity to do a day long walk into Mt Dromedary in the Derwent Valley. Reuben VK7FREU and the author drove from Hobart to New Norfolk and headed across the bride over the Derwent River and up into the hills on the Eastern side of the river. Black Hills Rd through Magra and continue up on a long slow climb until you get to Braslins Rd. We drove to the end of Braslins Rd where there is a parking area and a locked Forestry gate. From this parking area you can see Mt Dromedary in the distance. 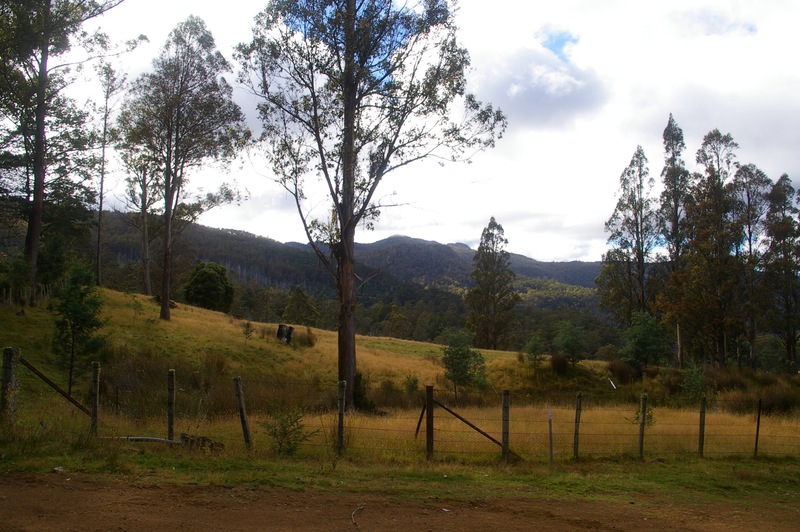 End of Braslins Rd – Parking Area – Mt Dromedary in distance. The walk in is along forestry tracks of varying quality and there are a few very wet muddy areas that you need to negotiate. At about 2km you reach a ‘y’ junction and take the right hand road. At 3km you reach another ‘y’ junction which you take the right hand road on the lower marshes track around the Little Marsh area. 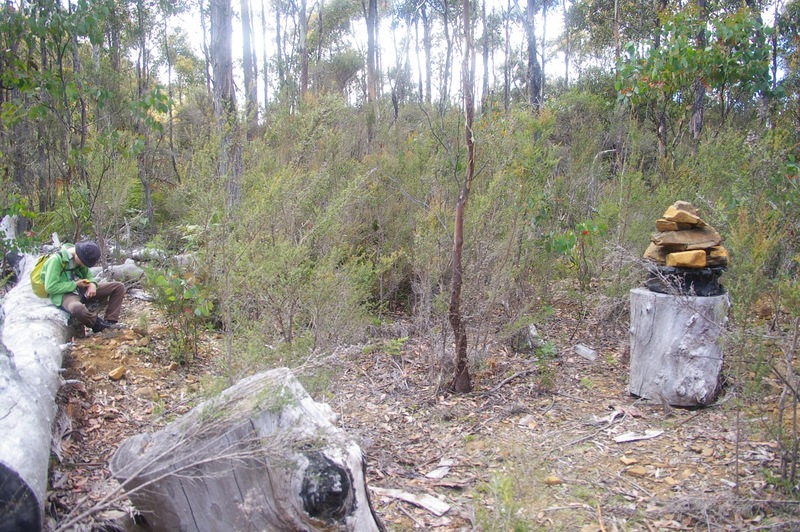 Just after 5km there is a ‘T’ junction and you head down the right hand track and at around 6km you will see the stone cairns and tapes on the trees for the steep more direct track up to the summit. We decided to come down this track on the way back. We continued along the main track for just under a kilometre and finally found the cairn and tapes on tree for the main track up to the summit. Markers for the start of the summit track. The start of this track is a little challenging to find the cairns and tapes but we managed to find our way through the bush. This track wanders along the contours and up into the saddle between each hump of the camel and at about 1.5 km gets to a junction. There are two peaks at the Eastern end of the summit one is slightly higher and has a trig point on it. The slightly lower summit has a nice open top and we decided to operate from there as it is still in the activation zone. Between us we made 28 contacts on 2, 20 & 40m with VK2, 3, 5, 6 & 7. We operated for about an hour and then had a late lunch. 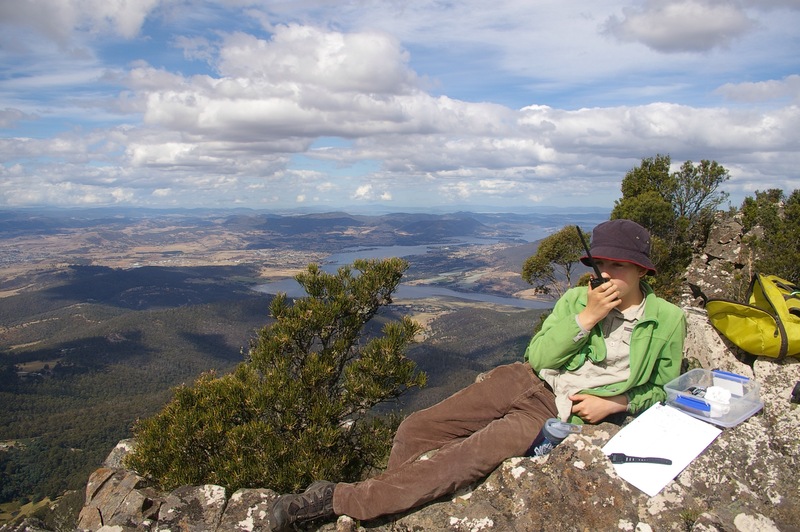 Looking toward Hobart down Derwent River – VK7FREU making 2m contacts. Going across to the trig point we saw a White Lipped Snake of about 400mm long. We gave it a wide berth and continued to the trig point. Some great panorama video and photos were taken. After some searching we found the track straight down and this is not a track for faint hearted to go down especially with heavy packs. Toward the top are some interesting loose rock ledges which you need to be very careful at negotiating. You drop 240m in the first 400m of the 900m length track. We were glad to have decided to come down this track not up it! Old growth Eucalyptus – monster tree. 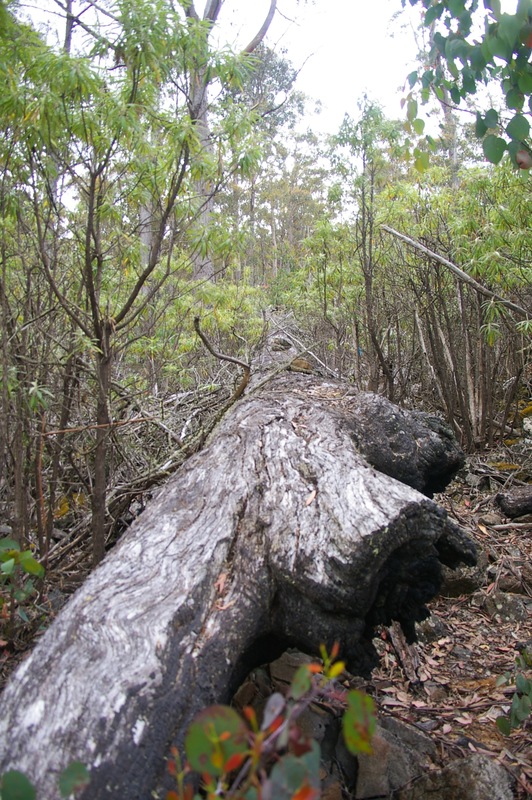 Along this track there were a few monster trees that had fallen in the forest. This one above was at least 30-40m long and was still 2m in diametre at the top! This monster was definitely old growth forest. We reversed our path out along the forestry tracks to get back to the vehicle. We left the vehicle at 10am and spend 1.5 hours on summit and got back to the vehicle at 5:30pm and walked about 18km in total. Thanks to all who contacted us, another successful activation. Hear from another summit soon. 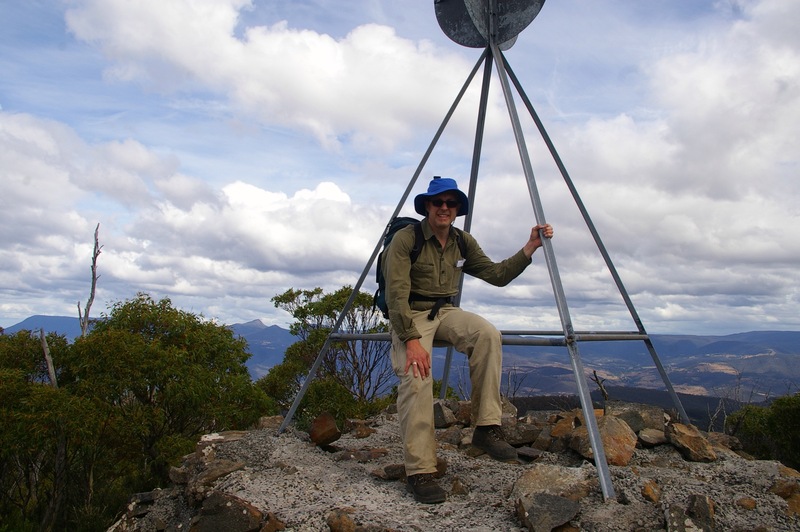 This entry was posted in First Activation, SOTA Activation and tagged 9/3/15, Amateur Radio, First Activation, Mt Dromedary, SOTA Activation, SOTA VK7, Summits On The Air. Bookmark the permalink.